New Era Nat Sulph No. 11 240 Tablets - SPECIAL OFFER! They have no side effects from the active ingredients. They are simple to take and safe with other medicine or supplements. There is no danger of overdose. A small percentage of people are sensitive to lactose, which forms the base of the tablets, and those people should check with their doctor before taking Combination H.
The tablets are pleasant tasting and dissolve instantly to get to work straight away. Over acidity of the blood; gastric disorders; heartburn; rheumatic tendency. - FOR A QUICK REFERENCE ON THE MEANINGS OF THE SALTS, VISIT OUR BLOG - CLICK HERE. - OR CONSULT THE BIOCHEMICAL HANDBOOK ON TISSUE SALT USES - CLICK HERE. 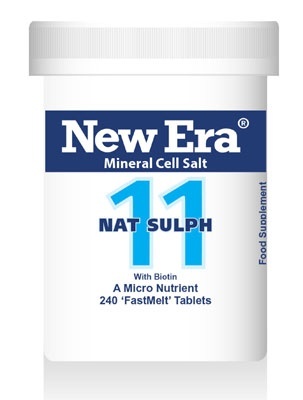 New Era Tissue Salts contains triturated (finely ground) tiny particles of cell salt in, easy to take, dissolve on the tongue, 'FastMelt' tablets. These are made using processes associated with New Era for almost 90 years. Adults: Dissolve 4 to 8 tablets on or under the tongue 3 times per day. Children to 12yrs: Half dosage. * In order to increase the success of the treatment, if at all possible try to avoid taking coffee, tea, alcohol, tobacco, and mint (toothpaste, chewing gum, cough drops, etc.) during your treatment. Also avoid inhaling strong substances such as chemical products and strong detergents. Store in a cool dry place out of the reach and sight of children. You should tip the tablets into the lid of the tub and then straight into your mouth - homoeopathic preparations are best if not contaminated by handling. New Era Biochemic Remedies are homoeopathically prepared from from safe, natural and non-habit forming ingredients. They are based on Dr Schuessler's Nutritional Biochemic System of Medicine. New Era contain Biotin which contributes to the normal energy yielding metabolism, functioning of the nervous system, normal macronutrient metabolism and psychological function. It also contributes to the maintenance of normal hair, skin and to the maintenance of normal mucous membranes. These Health Claims are approved as per the EU Register on Nutrition and Health Claims. Calc Fluor - for haemorrhoids, varicose veins, cracked skin, muscle strain & injured ligaments. Calc Phos - for anaemia, indigestion and bone diseases. Calc Sulph - for skin disorders, spots, pimples & slow healing wounds. Ferr Phos - for inflammation, redness, throbbing & the 1st stage of a Respiratory illness. Kali Mur - for mucous congestion, Coughs, glandular swellings, tonsilitis, & Sore Throats. Kali Phos - for nervous tension, Depression, irritability & tension headaches. Kali Sulph - for dandruff, dry scaling skin, chicken pox & other minor eruptions of the skin. Mag Phos - for spasmodic pain, muscle cramps, spasms & twitches. Nat Mur - for excessive moisture or dryness, runny nose, loss of smell & loss of taste. 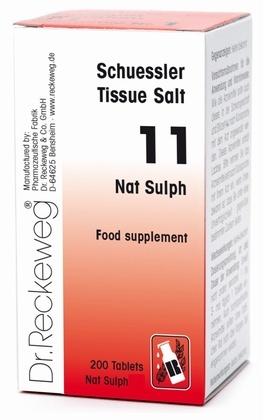 Nat Phos - for acidity, idigestion, dyspepsia & heartburn. Nat Sulph - for bilousness, liver upsets & water retention. Silica - for pimples, boils, Ulcers, styes & Hair, skin + Nails. - What are the tissue salts? - Click here. - The different brand names of the tissue salts - Click here. - Some facts about the cell salts - Click here. - New Era Tissue Salts History, Information & News - Click here. - Information about the Dr Reckeweg Products - Click here. - Mag Phos - The Anti-Spasmodic Tissue Salt - Click here. Send Us Your Review of New Era Nat Sulph No. 11 240 Tablets - SPECIAL OFFER! Standard Delivery - £2.99. FREE on orders over £20 within UK & Channel Isles. Complete Set of 12 New Era Individual Salts - BULK OFFER! Schuessler Nat Sulph No. 11 200 tablets - BULK OFFER! Products sold or supplied by www.neweratissuesalt.co.uk are not intended for the treatment, prevention and cure of any medical conditions. Never exceed recommended intake unless professionally advised.